This variety pack of natural treats is perfect for giving your dog something a little different, straight from the butcher's shop! 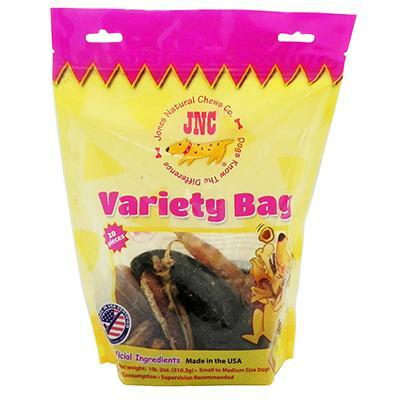 Contains a mix of any of the following favorite treats: Beef Hooves, Beef Rib Bone pieces, Pork Skin Roll pieces, Pig Ear slices, Beef Bully Stick pieces, Steer Stick pieces. As these are natural products, the contents and size will vary with each bag but measure approximately 2 inches or greater. Give your dog a taste of the good life.